Today's mission is to declutter glasses of all varieties that you no longer want or need in your home. 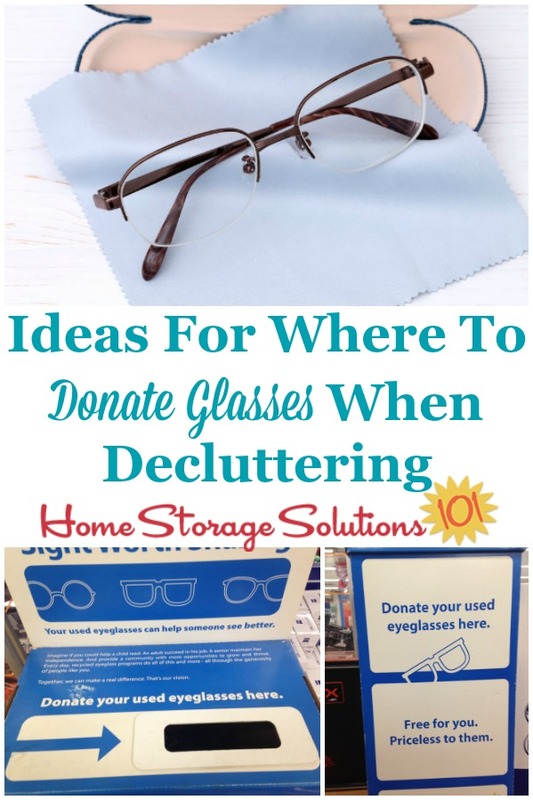 In addition, to help you I've provided ideas for where to donate glasses you decide to declutter. Of course, you can do this mission whenever you wish to, or feel the need to do so. When working on this task you should focus on eyeglasses, sunglasses, spectacles, and also reading glasses. For some people this may not be a huge task, if you've got just a few pairs of glasses, of any variety, but other people have a bunch, especially collections of sunglasses and also there are a lot of people who have lots of pairs of reading glasses. When working on this mission first gather all of your glasses of each variety together, so you can see how many you actually have. 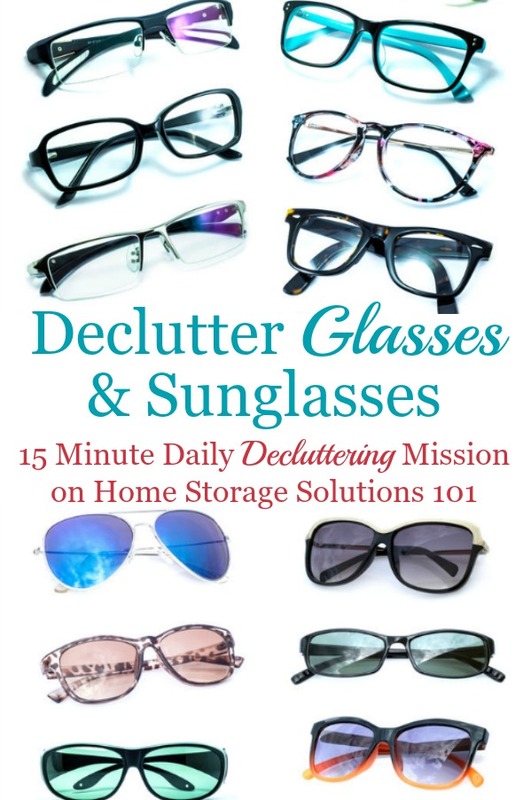 As always, you are not expected to (nor should you) declutter all of these glasses, but instead just the excess ones that you don't need or want anymore. Keep your most recent prescription eyeglasses, and I also recommend keeping a spare pair, in case your main glasses get lost or broken. This is especially vital if you need your glasses to do everyday functions like read, drive, or live life. (If you want to be even more prepared, you may want to keep an additional spare pair in your 72 hour emergency kit). While you can get a replacement set of glasses, since they're prescription the replacement process will take a bit of time, and you don't want to be without any glasses at all while you're waiting. After the main pair, and the spare of prescription eyeglasses, I tend to be of the opinion that that's enough, and to get rid of the rest. However, I do know some people enjoy switching glasses between different styles, to go with their mood or their outfits. Only you can decide how many pairs you should keep, but always be cognizant of how much room you've got to store all of your different pairs, and how often you really do switch to different glasses to know what's right for you. I would suggest keeping, at a minimum, one pair of sunglasses, and then it's up to you to decide if you need more than one pair. If you need prescription eyeglasses, and you've got a lot of older pairs of non-prescription sunglasses, it may be an easy decision for you to get rid of those non-prescription glasses. That's what happened with one Declutter 365 participant, Janie, who sent in this photo below. Janie said, "I found these sunglasses in a box on my shelf. I can't wear contacts anymore so they are useless. I can only wear prescription sunglasses." So, she explained, she got rid of them. I know many pairs of sunglasses, especially designer sunglasses, may have cost you a lot of money. If that's the case I hope you're wearing them frequently because otherwise, despite them costing a lot of money, they're still clutter in your home. Today's mission may require you to do a bit of soul searching, and getting real with yourself, about how much you actually wear various pairs of shades to decide what should be done with them. Most reading glasses are non-prescription, and can be replaced easily with a quick trip to the store. In addition, because this type of glasses are inexpensive many people buy a lot of pairs of them, so they can have them in all kinds of places, such as a pair in their purse, and several around the house. While convenience is important, so is not having too many pairs of reading glasses around, because too many can mean clutter. I suggest keeping a few pairs in places you consistently want and need to reach for your readers, so they're there for you. If possible, create a specific storage areas for them in that space, such as a bowl or basket you place them into, so they're easy to find, and you don't feel like you have to stock up on so many pairs because you can't ever find the ones you want. 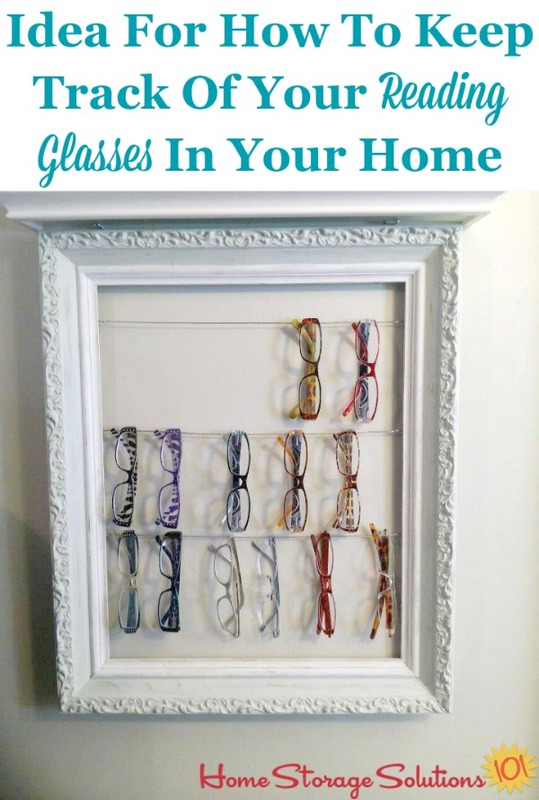 Another idea would be to gather all of your reading glasses into one place so you can always know where to find them. That's what a reader, Cheryl, did with hers, showing what she did in the photo below. She used a simple frame, that she strung wire across, to keep all of her pairs together, hanging on the wires. She said, "this has helped me a lot! I also keep a pair in the kitchen cabinet for quick use for recipes." 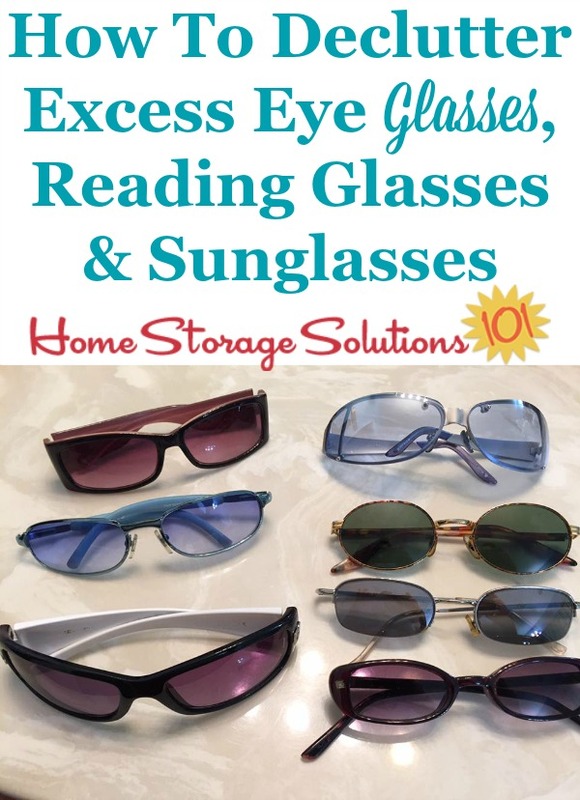 If you can more easily find the reading glasses you do have you won't have to keep buying new ones as replacements, and therefore can get rid of some of this excess glasses clutter in your home. After you've decided what glasses you're decluttering you've still got to decide what to do with those glasses you're not keeping. You've got several choices for what to do with them, prime among them selling, donating or trashing them. I only suggest that you throw away broken glasses or sunglasses if they can't be easily repaired. Otherwise, I suggest one of the two other methods -- selling or donating. For non-prescription expensive glasses or sunglasses, selling may be a worthwhile option for you, if you have the time to devote to the process of finding a buyer. 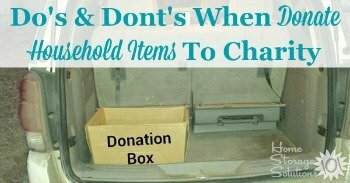 But for cheap non-prescription reading glasses, or sunglasses, donating is your better option because these types of glasses aren't worth much money to begin with. I would suggest donating these types of glasses to consignment or charity shops, along with most other types of accessories or clothing items. 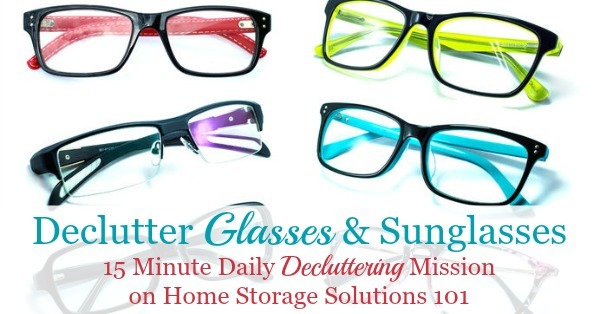 When decluttering prescription eyeglasses I don't suggest you try to sell these glasses. Practically, even if you paid a LOT of money for them (and with presciption glasses you often do), there's not a good way for you to find someone else that needs the exact or very similar prescription as yours, in the syle of frame you have, to make it feasible for you to sell them. That's where a chartity, like the Lion's Club, can help get these glasses into appreciative and needed hands. The Lion's Club has used eyeglasses collection bins in many locations across the United States. 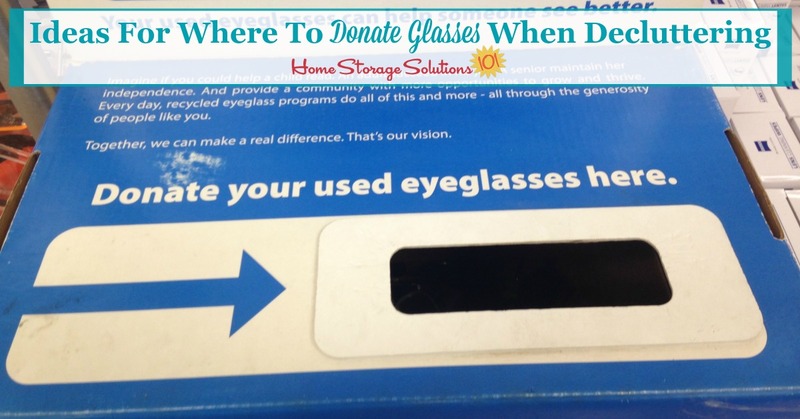 When you drop off your used glasses into these bins they're taken to a facility where, according to the Lion's Club website, "volunteers clean, sort by prescription strength and package the glasses. Recycled glasses are distributed to people in need in low and middle income communities where they will have the greatest impact." You can do a lot more good by donating those used prescription eyeglasses than keeping too many extra pairs in your home. You can contact your local Lion's Club to find out where a collection bin in your area is located, but common places to look include in your eye doctor's office or where you purchase glasses. For example, I took the photos of some of the Lion's Club collection bins in my local Walmart, in their Vision Center. When you get your new glasses you can keep one old spare pair and donate older spares into these bins. If you can't find a collection bin in your area you can also mail your used eyeglasses directly to the Lion's Club for donation. You can find out more at this link to the Lion's Club website. 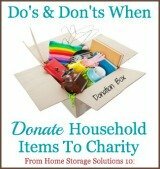 You can get even more ideas for places to donate items when decluttering your home, plus do's and don'ts for what to donate to charities, in my donate clutter section of the site. I hope these instructions have inspired you to get rid of used and excess eyeglasses and other types of glasses in your home.